​As America moved into the 20th century, the industrial age and technology was impacting fire equipment and apparatus in a big way. Larger cities, such as Boston, New York, Baltimore, and San Francisco, were starting to transition from the horse drawn steam engine into the motorized era. 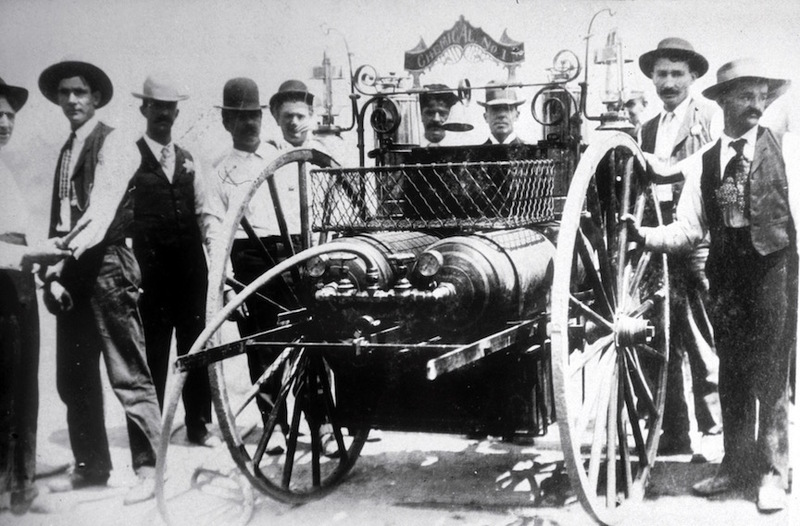 Until the mid-19th century, most fire engines were hand drawn by men, and were primarily “hand pumpers” or “hand tubs”, hose carts, and hose or ladder wagons. 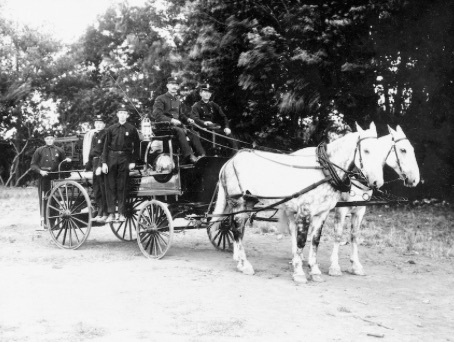 The introduction of horse-drawn fire engines had greatly improved response times to fires. 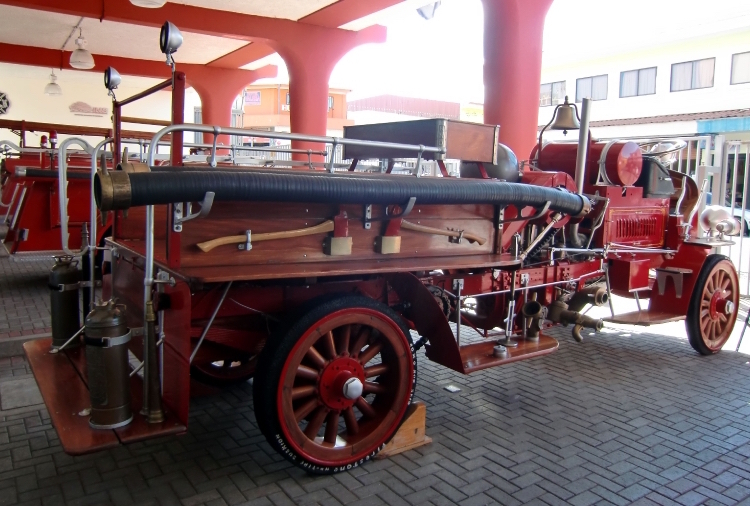 The first self-propelled steam-driven fire engine was built in New York in 1841. However, the volunteer firefighters saw it as a threat, and destroyed it through sabotage. 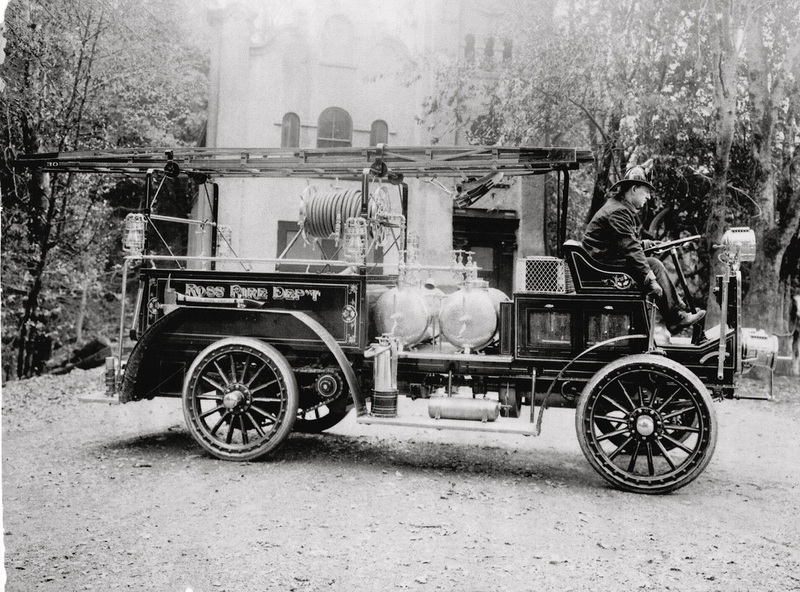 In part due to resistance to change, motorized fire engines did not become commonplace in the American fire service until the early 20th century. At this time in history across the bay from Marin, the San Francisco Fire Department had 450 horses! You can guess what “Lets clean up the fire house…” meant in those days. The horses had been a great success since 1863 when first placed in service. A special breed had been developed to meet the needs of the FD - a cross between Percheron mares and English Trotter stallions. The horses were placed in service at four years old and often served to the age of twenty-four years, and then retired to a farm near Martinez. 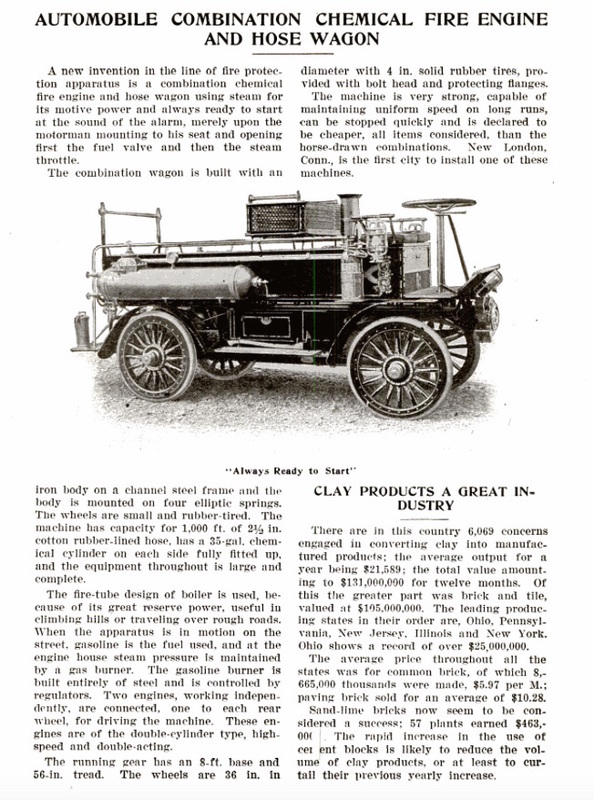 According to a Popular Mechanics article in 1905, converting gas engine motor trucks into fire engines was well underway. Such trucks were being introduced successfully in England. That same year, the Knox Automobile Company of Springfield, Massachusetts began selling what was described as the world's first “modern” fire engine. A year later, Springfield FD was completely supplied with Knox gas-powered fire engines. With this arrival of motorized equipment however, the end of the usefulness of horses was sadly drawing near. On July 11, 1912, a contest between the horses and the new motorized trucks was held in front of San Francisco FD Chief Thomas Murphy, the Fire Commissioners, the Fire Committee of the Board of Supervisors, and a large public crowd. The best horse drawn engine in SFFD would race the new Nott Motor Engine to show which was the quickest and most effective. The contest started at 2nd Avenue & Clement Street, the home of 26 Engine. At the sound of a gong the horses bolted into their collars and ran out the door, dragging the smoking steamer. The Nott Motor Engine driver cranked the motor and quickly followed. The goal for the Nott Engine was to take the hydrant at 13th and Lake Streets. 2 minutes and 20 seconds later, the team had water flowing out the nozzle with a total elapsed time of 3 minutes and 40 seconds. The steamer horses and team pulled up to the assigned hydrant at 11th and Lake Streets in 3 minutes and 55 seconds, and had water flowing in 5 minutes and 6 seconds. The results were painfully obvious - the days of the horses was over, and none were purchased following this event for FD use. The first motor driven SFFD apparatus was installed in Chemical Company No. 3 on Bush Street in 1912. In the case of Marin County, there were no known hand pumpers or steam engines in use by 1900. Marin FD’s mostly had hand drawn hose carts, sometimes with chemical tanks, and chemical wagons. A few larger departments, like San Rafael and San Anselmo, had horses to bring their apparatus to the fire. Most communities, however, relied on men to drag the equipment to the fire over the dirt roads and trails. Keep in mind the total population in Marin at that time was only 15,702 people, spread across the whole county in much smaller numbers. Following the 1906 San Francisco Earthquake and Fire, however, the population had almost doubled by 1920, as displaced former residents of San Francisco relocated north, east, and south. With this growth in Marin, the need for fire departments increased, and the community’s ability to fund new equipment greatly improved. Let’s now step back in history and cover two events that would allow motorized apparatus to happen. First, up until then, the oil from whales was used to drive American and world machinery, and to provide light at the end of the day. 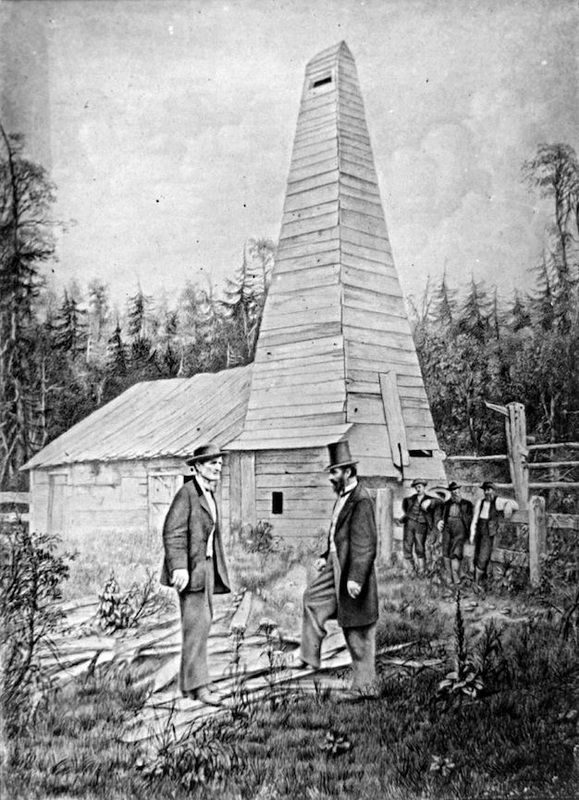 On August 28, 1859, George Bissel and Edwin Drake made the first successful use of an oil drilling rig, at a site on Oil Creek near Titusville, Pennsylvania. They were encouraged by Yale Chemistry Professor Bejamin Stillman, who had tested a sample of the oil, and told them that it could be distilled into useful products such as lamp oil. The Drake well is often referred to as the "first" commercial oil well, although that title is also claimed for wells in Azerbaijan, Ontario, West Virginia, and Poland, among others. However, before the Drake well, oil-producing wells in the United States were originally drilled for salt brine, and produced oil and gas only as accidental byproducts. A well intended for drinking water at Oil Springs, Ontario hit oil instead in 1858, a year before the Drake well, but it had not been drilled for oil. The Drake well was not the first well to produce oil, but it attracted the first great wave of money towards oil drilling, refining, and marketing. It encouraged additional drilling, that would later result in enough petroleum to support greater business use. The product that would support the development of the internal combustion engine was brought to the surface, and whale oil was no longer necessary. The second event was when German Engineer Nikolaus Otto invented the four stroke gas engine in 1876. A French gentleman by the name of Porteu, then took Otto’s design and developed the first fire engine. First publicly demonstrated on August 5, 1898 in France, the contraption had a four cylinder gasoline engine rated at twenty-two horsepower, and could move at the high speed of nine miles per hour! If this were the Olympics, two gold medals for the first American motorized fire apparatus would have to be awarded. 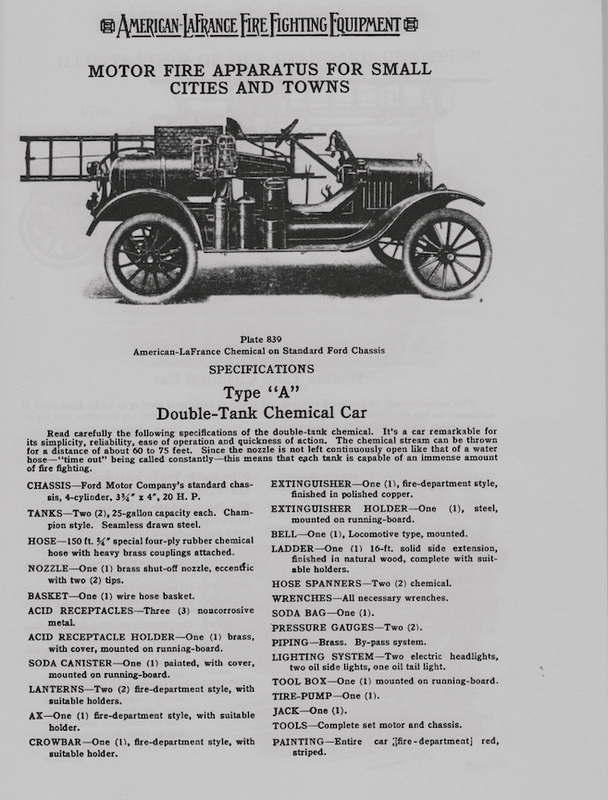 In 1906, the Knox Automobile Company would deliver their first motorized chemical fire wagon, with two 35 gallon tanks, to the Springfield FD in Massachusetts. The Knox Company would be in business until 1928. The second gold metal went to the C.R. Waterous Engine Works Company of St. Paul, Minnesota. They delivered a motorized engine to Wayne, Pennsylvania in 1906 and are still in business today. 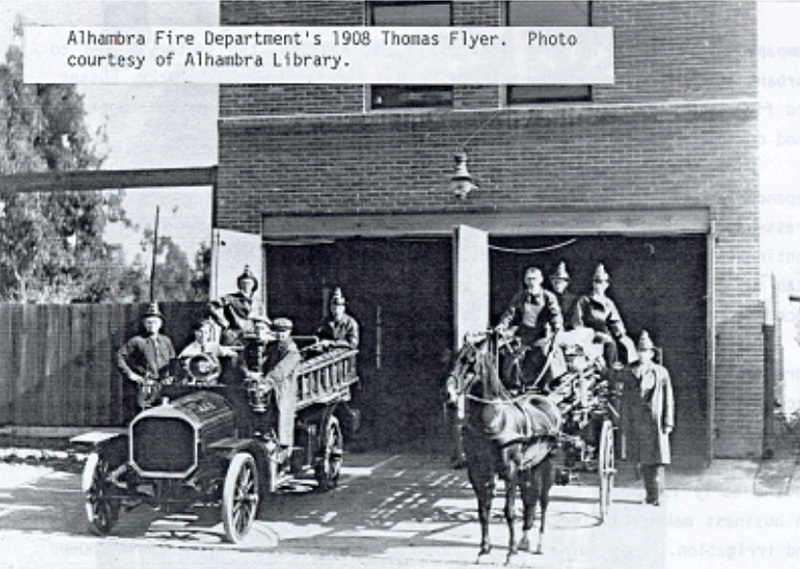 The oldest motorized gas fire engine west of the Rockies was Alameda's 1907 Waterous pumper. Unfortunately it was wrecked a year after being placed in service. Long Beach had two 1907 Rambler chemical hosewagons, which they later sold to Newport Beach. Pasadena's chemical wagon is a 1909 Seagrave AC40. From this point forward, hundreds of fire apparatus companies would open shop to take advantage of the boom in fire engines. This included companies like American La France, Seagraves, Pope-Hartford, and Peter Pirsch & Son. Many local small businesses would also manufacture chemical fire wagons from kits they purchased. Meanwhile in Michigan, Henry Ford began to build motorized fire trucks. They were put together like a kit, with FD’s purchasing one from a local Ford dealer for around $480, and then using a local company to assemble the chemical fire equipment section to the FD specifications. See Figure 1. The Model T had a 177 cubic-inch four-cylinder motor, placed in the front and powering the rear wheels. The 20-horsepower engine was capable of powering the vehicle to a top speed of around 45 mph. There were three main bearings and side valves. A ten-gallon fuel tank could be found beneath the front seat, mounted to the frame. The engine was started by a hand crank located at the front of the vehicle. The crank was very difficult to operate and was the cause over the next few decades of many broken arms. The three-speed unit was actually two-speeds forward, plus one reverse. With no clutch pedal, shifting was handled by floor pedals that did not require a clutch. Also located on the floor was a third pedal for operating the reverse gear. 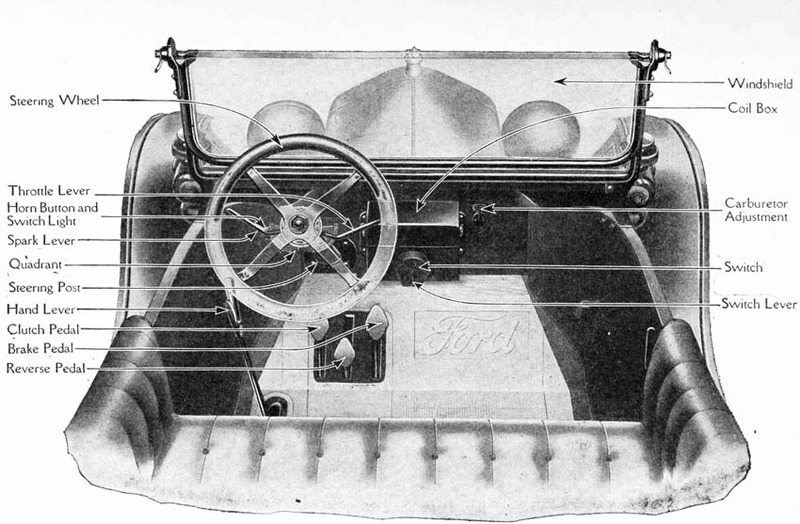 The throttle was controlled by a lever on the steering column. Neutral was located by the parking brake lever. The other foot pedal applied a band around a drum in the transmission. The parking brake lever operated the band brakes on the outside of the rear brake drums. When the hand lever was pulled back, the brake was engaged and the drive gears were disengaged. The Larkspur Volunteer Fire Department (LVFD) is a good example of the transition to motorized apparatus in Marin - . 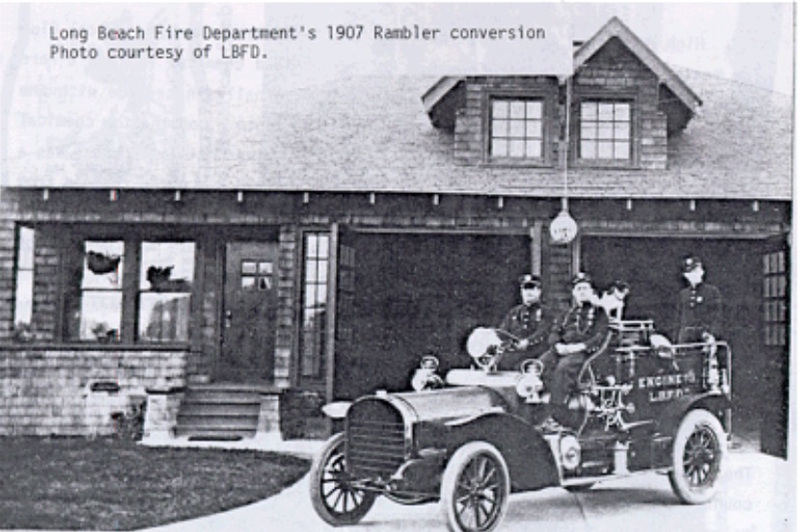 With the Larkspur “Booster Day” celebration fund-raisers and the new outdoor "Rosebowl Dance Pavilion" sponsored by LVFD, by 1915 the volunteers had enough money in the bank to build one of Henry Ford’s new fire trucks. On August 6, 1915, the volunteers decided to sell one of their two hand-drawn chemical engines for $300.00. The funds would go to the cost of a new American La France Ford truck, with all the ‘bells and whistles’. See Figure 2. On a motion duly made, the LVFD Chair was empowered to appoint a committee of three to draw up specifications for a suitable Automobile Fire Truck, and to submit to local firms for bids. It was to built of standard materials and would have Fire Underwriter's of San Francisco assist in its development. On August 20, 1915, Fire Underwriters confirmed they would send an engineer over to assist in the specification. See Figure 3. On October 15, bids were opened, with the following firms submitting bids. Deyscher & LaFargue of San Anselmo, whose bid was $1195.00 with a copper tank installed. Jules Levy of San Rafael, who bid $1050.00, with steel tanks as per specification. A vote was held over until Oct.15. On Oct. 22, the bid was awarded to Deyscher & LaFargue. They had started out as a Blacksmith shop at the hub in San Anselmo. The shop was roughly where the Jeep Repair shop is today, on the north side of Sir Francis Drake Boulevard, just west of the hub intersection. See photos and ads in the slide show below this article. They ended up making chemical fire wagons for Ely, Nevada; Spokane, Washington; and many Southern California departments. They would also build the San Anselmo FD Chemical Wagon in 1915. If we could look back in time, this is what the America La France kits would look like once delivered to San Anselmo. See Figure 3. On an interesting side note, firm partner William L. Deysher later served as a Marin County Supervisor. He was eventually convicted of defrauding the County, and served time in San Quentin Prison. 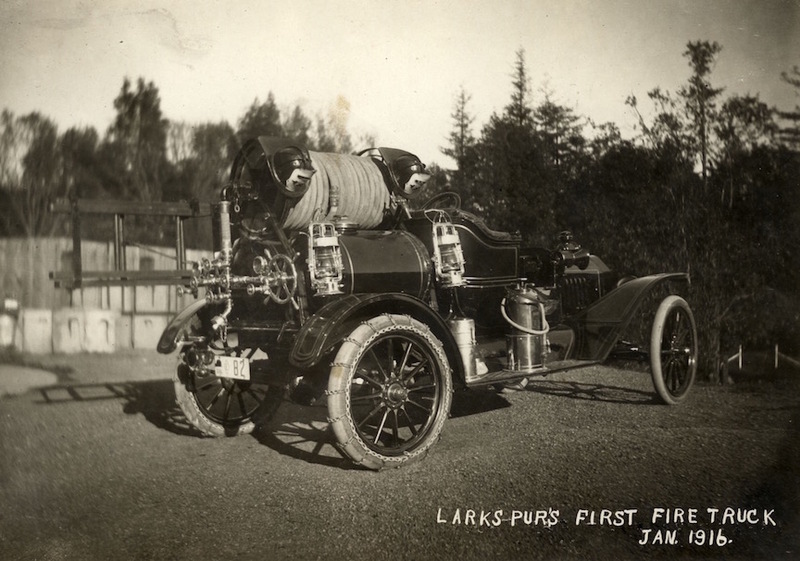 On January 7, 1916, the Larkspur Volunteer FD accepted the new Ford Model T Chemical Wagon. In March of that year, Larkspur Chief Dolph Doherty insisted that a number of two-member committees be assigned to maintain the Chemical Wagon, each for one month at a time. The rotations of committees were posted on the blackboard, which was provided by Professor Henry C. Hall - the local school principal. A middle school was later built honoring Hall, that today is adjacent to the Central Marin Police Authority Headquarters and Piper Park in Larkspur. ​The first committee was Chief Doherty and J.F. Murphy. With the introduction of acids and other corrosive chemicals, the safety of the engine operations were critical, and the apparatus had to be clean of any corrosive. It was recommended that if any chemical got on the engine, the engineer was to wash it with water only, not to rub it off. If rubbed it off instead, it would smudge and damage the finish. With these new engines the FD’s had to buy and store the chemicals in a cool, dry location. The soda was sold in barrels of 112 pounds at a cost of 6.5 cents per pound, or roughly $7.28. The compound had to be the very best grade of 66-degree Sulfuric Acid. It was sold in cartons containing 80 pounds at 7 cents per pound. On July 21, the Chief reported a fire in a cottage was extinguished by the new Chemical engine, after Fire Alarm Box 32 at Madrone and Orange was pulled. In January, 1917, a new hose reel was added to the Model T chemical engine at a cost of $650.00. A new four-speed attachment was added to the engine at a cost of $400.00. Chief Doherty reported that the chemical engine could then climb all the hills in Larkspur without any concerns. 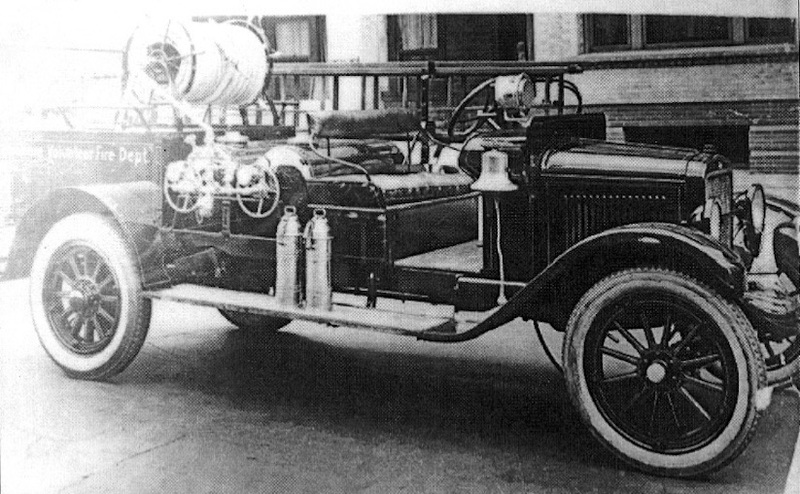 In March of 1917 the Model T fire engine wheelbase was extended at a cost of $841.66. 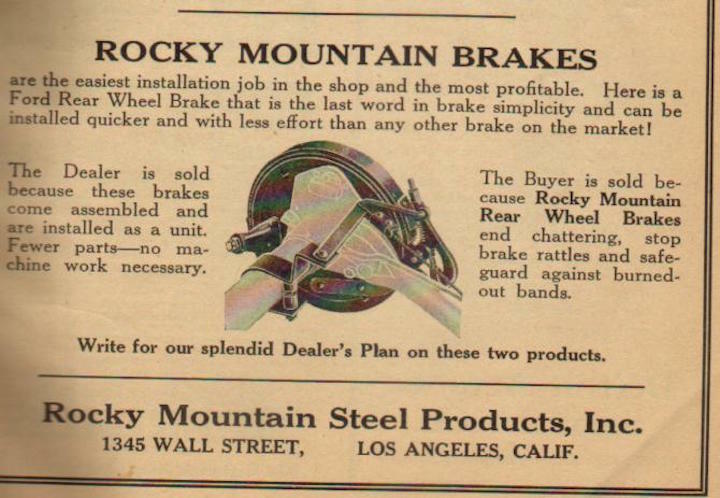 Most likely this was when they also added the "Rocky Mountain" rear wheel brake assemblies for better braking. Throughout it’s history the chemical engine performed quite well. For example, it helped save the Bon Air Hotel several times. Within six years there were non-chemical fire engines being offered. LVFD considered purchasing a 1922 Stutz Fire Engine from Indianapolis, Indiana. With the success of the Booster Days and the Rosebowl Dances, the volunteers had good sum of money on hand. At the same time the City of San Rafael FD was going to entertain the purchase of a new Stutz engine. 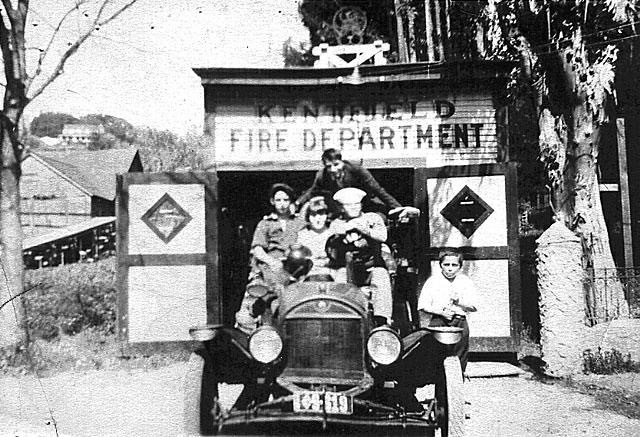 When the Kentfield Fire Department heard that LVFD was getting a new engine, they offered to buy the Model T Chemical Engine and a hose cart from the Madrone Canyon fire shed at a cost of $1,100. The little Ford Model T “who could”, did, for the town of Larkspur. On November 23, the department took proud possession of the 1922 Stutz Fire Engine. The Larkspur engine was called a “Baby Stutz”, being somewhat smaller than the full-size San Rafael engine. By the 1920’s the chemical fire wagons were so popular that they were in almost every fire house in America. To prove their effectiveness, the insurance industry asked each department that had a chemical engine to tell them the years of service, and the percentage of fire they extinguished with them. Here is an example of that survey, broken down by location, years of service, and % extinguished (all in California): San Francisco, five years, 50%; Healdsburg, twelve years, 50%; Los Angeles, three years, 60%; Stockton, twenty-one years, 72%; Some departments in the survey claimed the chemical engines extiguished 95 to 100 % of their fires. 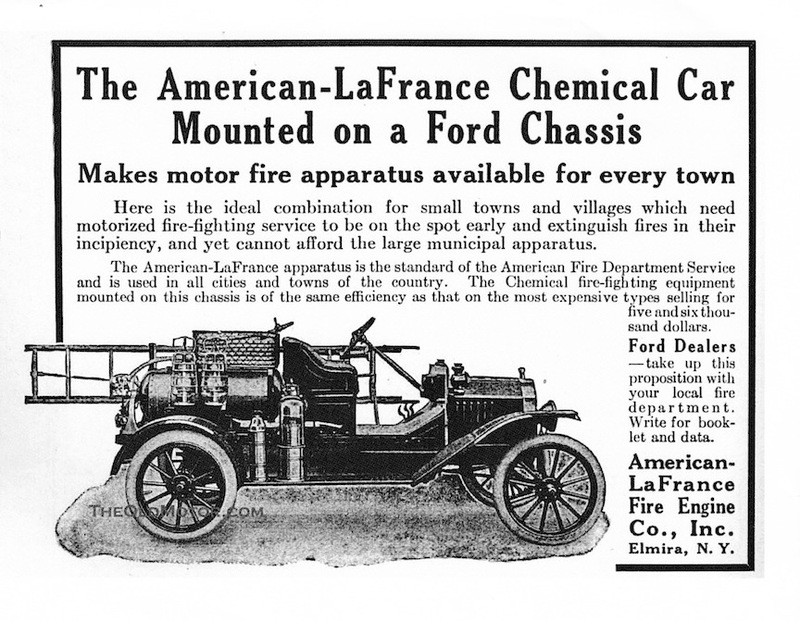 The cost was well within the reach of the smallest town or village for American La France Ford Model T fire engine kits, implemented for under $500.00, or roughly $6,250 in today’s dollars. Once the engine arrived at the fire, the operators had to follow very strict rules. Once the acid bottle was inverted or broken, it would take ten to fifteen seconds for a pressure of 140-180 psi to register on the gauges. If the engineer were to fill the tank above the safety line, the pressure in the tank could reach 1000 psi. This pressure was too much, and would most likely destroy the tank and injure the operator. The water would flow through 150’ of ¾”, 4-ply rubber hose. With a eccentric chemical shut off nozzle, a stream of 60-100 feet could be applied by the firemen. With the shut off nozzle they could extend the water in the tanks, and when the first tank went dry the second tank was opened while the engineer replenished the first tank. Most engines carried two supplies of chemical on the running boards, giving them almost 200 gallons of water. The new engine also had a 2.5” inlet, so water from a hydrant could be used to continue operations. It was recommended in recharging a cylinder that the a bag of bicarbonnate of soda be placed in a bucket of water until it was completley desolved before placing in the tank. This was to prevent the chemical from caking and settling to the bottom of the tank, which would have hampered the water flow to the discharge line. A mechanical agitator was recommended turned on as soon as the chemical was added to the tank. When reloading the hose it was recommended placing it in the basket in a clockwise manner, so that when the tank was pressurized the hose would expand and tighten the coupling. If it was loaded counter-clockwise, the coupling could come undone. Marin County had a number of fire departments that added the new motorized gas engines to their fleet over the next 15 years. For example, in 1910 the Ross Fire Department saved the home and contents of a Mr. John Martin. He then donated a $5,500.00 combination chemical and hose wagon. It is thought that this engine was one of the first ones on the West Coast. ​Sausalito FD purchased a Martin truck from San Francisco - it was used to transport hose and equipment. They also owned a 1924 Hewitt-Ludlow Chemical and Hose Wagon. According to retired Tamalpais Valley Fire Chief Bob Souza, his father Ed Souza, a 52 year member of the Sausalito volunteers, drove the Hewitt Ludlow to the Mt. Tamalpais Mill Valley fire of 1929. "It was not used to fight the fire but was assigned the duties of salvage operations. It, and other apparatus, removed valuables from homes in the path of the fire and deposited them at the Depot in the town square." Mill Valley’s first motorized fire truck was a 1918 DeMartini Chemical and Hose Wagon. 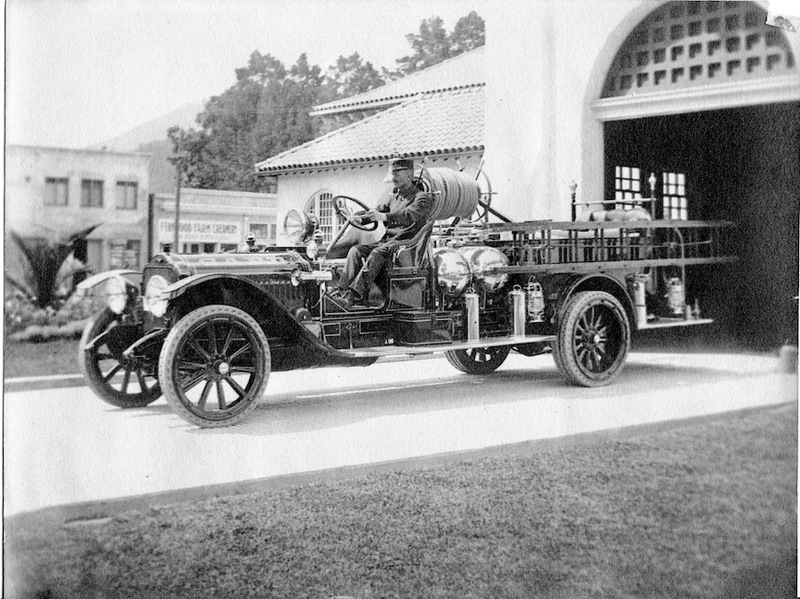 Corte Madera's first fire truck was a Chevrolet Pope-Hartford acquired in 1916. San Anselmo in 1915 would put 'out to pasture' their two trained fire horses "Major and Colonel" when they took delivery of their chemical wagon. The San Rafael Hook and Ladder company bought a combination chemical and hose wagon from Pope Hartford Manufacturing Company of Hartford, Connecticut. ​Novato FD would purchase a Model T Chemical and Hose Wagon in 1923 that was converted to a water tank and pump one year later. See the separate feature on this engine in this section. ​The chemical fire wagon days started to come to an end when Charles Fox, working for Ahrens-Fox in 1913, developed a gas-powered pumper with an 80-gallon water booster tank engine mounted behind the driver seat. Ahrens-Fox would go on to be very successful, including selling many engines to the U.S. Army that would be used in America and overseas. An example of a U.S. Army engine is pictured to the right. Note the lettering on the front motor cover - U.S.Q.M. stood for the Quartermaster Corps, the division of the Army that provided supplies, equipment, and fire protection among other services. It is the Army's oldest logistics branch, established in June 1775. However, it would take almost 20 more years before the fire service would give up it’s love affair with the chemical wagon on a large scale. 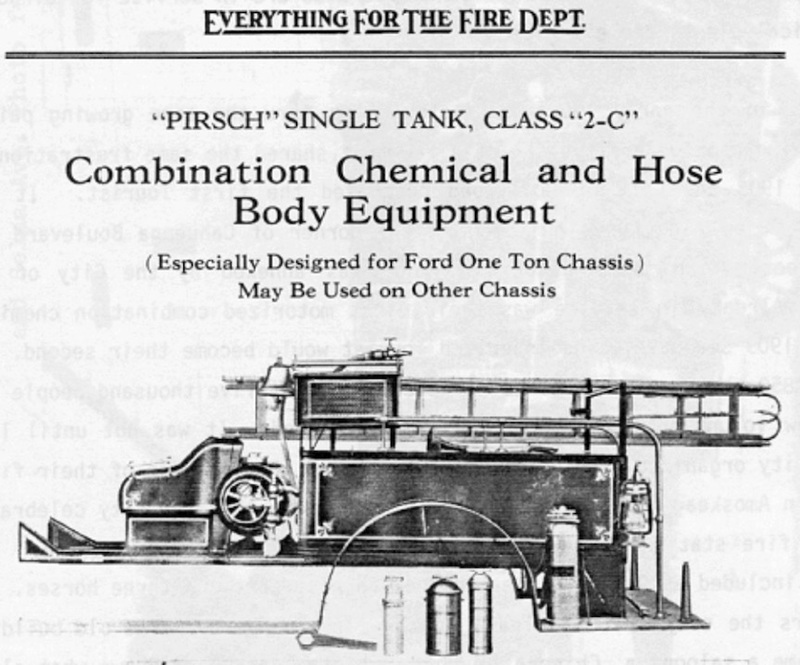 The last chemical wagon manufactured in America was a five-tank system on a 1934 Ford V8 American La France, sold to the Ridgeway Fire Department back east. A San Francisco FD Steam Engine and Horses. Inside a San Francisco FD Fire House with a steamer and horses. 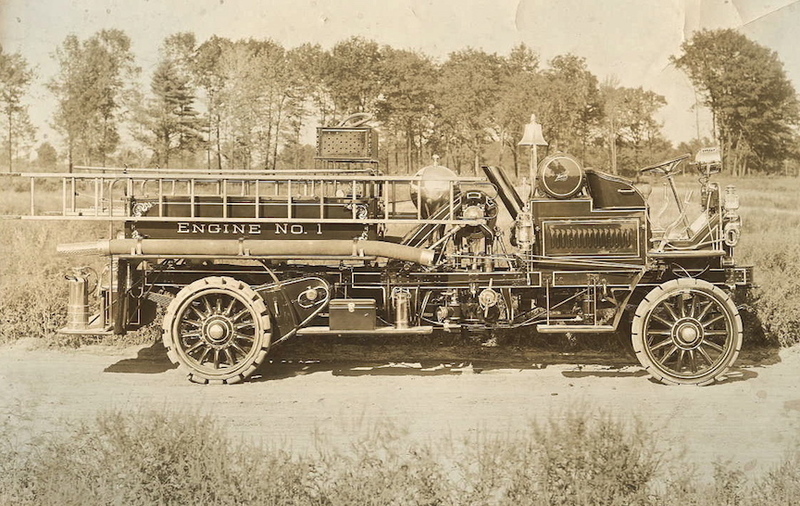 The first gas powered motorized fire engine in America, built for the Springfield Massachusetts FD by the Knox Company. One of Larkspur VFD's hand-drawn Chemical Engines. 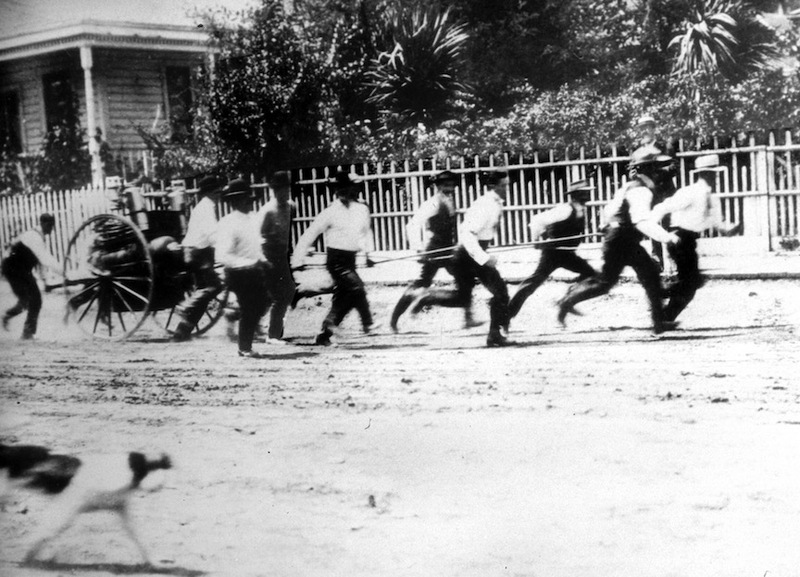 Larkspur volunteers running with one of the chemical hose carts on Magnolia Ave. 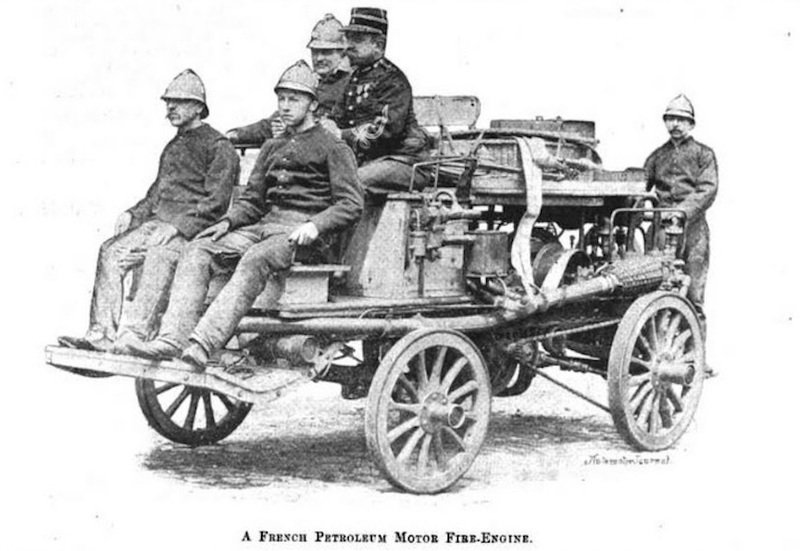 The first known motorized fire engine, located in France. 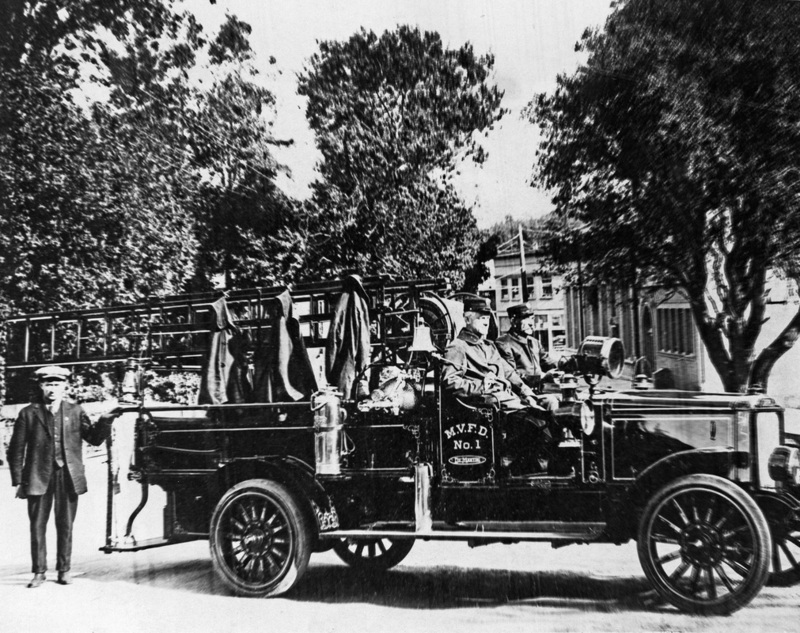 A 1910 Knox Fire Engine. Long Beach FD's 1907 Rambler Chemical Engine. A 1908 Thomas Flyer chemical engine on the left, paired with a horse drawn apparatus. The controls for a Model T.
Figure 3 - A fire engine kit for a model T.
A typical ad for a fire engine. Figure 2 - The 1916 Ford Model T purchased by the Larkspur Volunteer FD. The Ross FD Chemical Engine donated by Mr. John Martin. A 1910 Seagrave AC53 that cost $5,500.00 (approx. $137,000 in 2016) combination chemical and hose wagon. 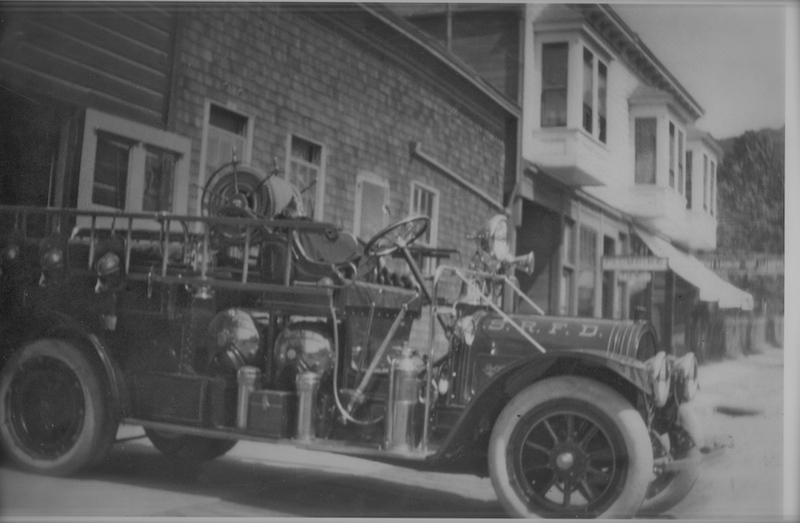 Mill Valley Chief Charles Thoney in driver seat, Leslie Armager in the passenger seat, in front of station on Corte Madera Ave.
San Rafael FD's 1913 Pope Hartford Chemical Wagon in front of the old fire station on C Street. San Anselmo FD's 1915 White Deysher and LaFargue Chemical and Hose Wagon in front of the old fire house where town hall now stands. Belvedere VFD's 1920 Willys-Overland Chemical and hose wagon. Kentfield FD members and family in the Ford Model T purchased from Larkspur FD in 1922. Unknown year of photo. Note that the original front body appears in this photo. The T was later upgraded with a front body from a 1922 or 1924 T that included a windshield, fenders that were more rounded, and a different look around the radiator cowling. Corte Madera VFD's 1915 Chevy Pope-Hartford Chemical and Hose Wagon, parked in front of the fire house in what would later be called Menke Square, on Tamalpais Avenue between the Episcopal Church and Mahood Brothers General Store. The Town dog "Laddie" is also pictured. San Anselmo's horse-drawn Chemical Hose Wagon.Their trained fire horses are named "Major and Colonel", purchased in 1911 for $500. When the fire bell sounded, both horses stopped what they were doing and rushed into position in front of the wagon. in 1912, (l-r) Dominic Ferrero, Tom Butler, Joe Flynn, fire Chief Charles Cartwright, and Assistant Chief Ernie Durham. A U.S. Army Quartermaster Corps Ahrens-Fox Fire Engine in 1917. Some related general photographs and ads showing the transitional era to motorized fire apparatus are featured in a slide show below.